Eli Hall had an interesting decision to make when it came to his choice of college and continuing his running career. On one hand, he had nearby Montreat College, a place he knew well having had watched two older brothers attend the college and compete as runners there. On the other hand, he had Emmanuel College, located in northeast Georgia, where one older brother, Ben, is the head track and field and cross country coach and another older brother, Noah, is the residence director. 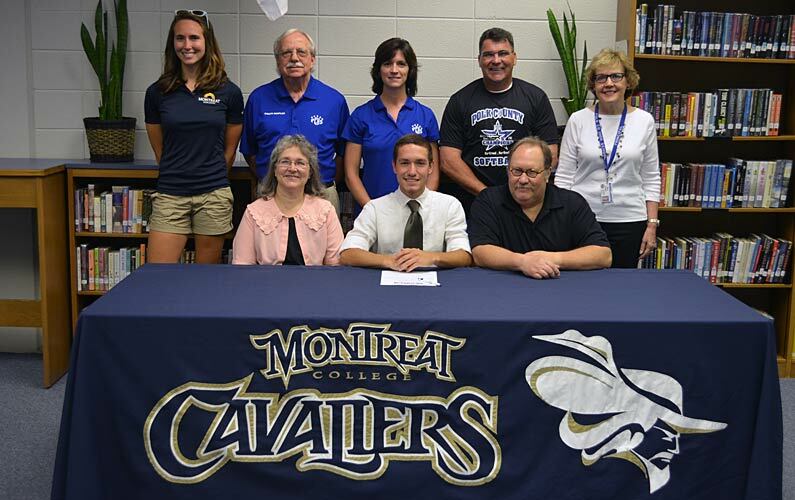 In the end, the familiar won out as Hall, flanked by his parents and surrounded by teammates in the school library, signed a letter-of-intent Friday to run for Montreat. He becomes the 11th Polk County senior to sign a letter-of-intent to compete at the college level. “Montreat, with Ben and Noah having gone there, I’ve been there a good bit and I love everything about it,” Hall said. “They also have a new coach coming in (Jason Lewkowicz) and I’m excited to be working with him as well. Friday’s signing had a bittersweet tone for Polk County head coach Alan Peoples, who coached all five of Richard and Angela Hall’s children. “We call it the Halls of running,” Peoples said. “I’ve had a Hall on my team for the last 13 or 14 years. I don’t know what I’m going to do without one. Hall, who competed in cross country, indoor and outdoor track at Polk County, will do the same at Montreat. He began talking with the school at this year’s state indoor meet, and the program’s interest continued even after Lewkowicz came on board in April as its new head coach. Montreat assistant coach Breanne Newton attended Friday’s signing. Hall plans to study outdoor ministry at Montreat. “I’m really excited about what is in store for me there,” Hall said.